A man praying at the ninth century Gavi Gangadhareshwara Temple, carved out of a single rock. Photo: Aniruddha Chowdhury/Mint. On the narrow, crowded Balepet Main Road in the heart of south Bangalore, I walked through an old wooden door with peeling blue paint, a door so imperceptibly squeezed in between two small shops that I almost missed it at first. My walk had brought me to the historic but largely unknown Sugreeva temple. A temple dedicated to Sugreeva is rare anywhere in India, but to come upon its quiet existence in the heart of Bangalore’s commercial district astonished me. The city’s rich and ancient temple heritage mirrors the story of the forgotten Sugreeva Venkateshwara Temple. Pockets of history, legend and folklore are hidden in the midst of a city eager to rush ahead; among people in a hurry to reach some place else. The Sugreeva Venkateshwara Temple. Photo: Aniruddha Chowdhury/Mint. Poornima Dasharathi, writer and founder of Unhurried, who conducts heritage walks in south India, says Bangalore’s history would be as well-known as Mumbai’s or Kolkata’s but much of it has been lost in the frantic march of development. Some of this history has managed to survive in small, forgotten temples, which I had decided to see and explore. In Nagarathpet, just 1km from Balepet, lies a shrine as rare as that of Sugreeva. This is a temple dedicated to the Pandavas and Draupadi (who is worshipped as Adi Shakti). The Dharmaraya Swamy Temple’s prangana (courtyard) is large and empty. The sanctum sanctorum is full of people. Apart from the idols o@f the five Pandavas and Draupadi, there are also portraits of Krishna and Adi Shakti. The Dharmaraya temple is also the starting point of the annual Karaga festival, a 500-year-old mythical tribute that is a nod to syncretism. Every year around April, a man dressed as a woman carries the karaga (a 3ft-tall pot symbolizing Draupadi) on his head and parades through these old parts, followed by a procession of devotees. After the Kurukshetra war in the Mahabharat, Draupadi donned the form of Adi Shakti and created an army of soldiers to kill the demon Tripurasura. When the soldiers asked her to stay back with them, she promised to come back every year—the Karaga festival celebrates this event. Over the years, the festival has transcended caste and religious barriers—a fact largely unknown to Bangaloreans outside this small world. One of the first stops the Karaga makes is at the Hazrat Tawakkal Mastan dargah in Balepet. 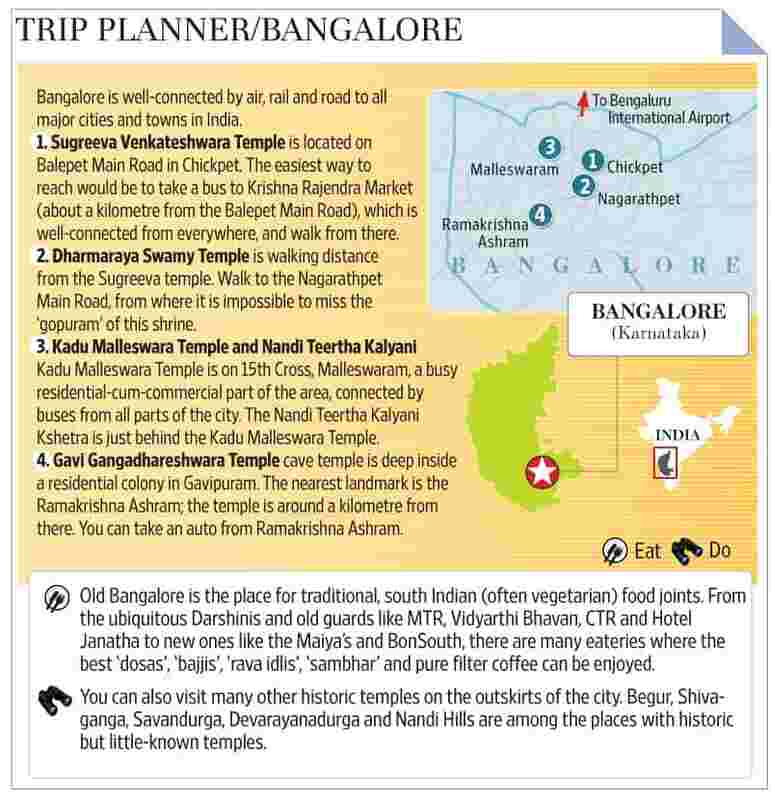 Historian and author Suresh Moona says there are more than 30 temples in Bangalore that are at least 100 years old and have rich histories of their own. He tells me to “at least not miss the small patch of Hampi", just metres away from the spanking new Metro station of Ulsoor. I set out to see the Someshwara Temple, said to have been built by Bangalore’s founder Kempe Gowda I. Legend has it that an exhausted Kempe Gowda slept under a tree after a fruitless hunting expedition. Lord Someshwara is said to have appeared in a dream and instructed him to dig at that spot for treasure and use it to build a temple right there. Built in the classical style of the Vijayanagara temples, this temple is magnificently carved; without an inch of space on its outer walls and pillars. Elephants, lions, horses, musicians, gods, goddesses, chariots, dancers, all come together in happy companionship. All around it is Ulsoor showing off the trappings of a modern city that it has acquired over the years—huge billboards, a curving flyover, snail-paced traffic and, of course, the Metro station. Moona also asked me not to miss the Kadu Malleswara Temple that gave its name to Malleswaram, one of Bangalore’s oldest neighbourhoods. Built by Ekoji, the brother of Maratha leader Shivaji, the temple’s serene garden is full of old peepal, Ashoka, guava and other trees, amid which are several small idols of Nagas. Moona tells me that when the temple was originally built, the entire area was a thick jungle, hence the name Kadu (forest) Malleswara. Right opposite is the 400-year-old Dakshina Mukha Nandi Teertha Kalyani temple. “The structure of this temple, where everything converges to an open centre, is unusual. Rare too is its peculiar architecture, where a pond teeming with tortoises and fish is in front of the black granite idols and Nandi is placed above Shiv, so that water from its mouth continuously falls on the idol," Moona explains. My final stop was the ninth century Gavi Gangadhareshwara cave temple. The temple inside a natural cave in Gavipuram is most famous for its tryst with the sun every year during the Makara Sankranthi festival. At around 5pm, the sun’s rays pass through Nandi’s horns and fall on the linga inside the cave. One of the few temples in India to have a sculpture dedicated to Agni, the temple has many unusual features, including two huge rock-cut discs placed parallel to each other in the front yard. The outer shrine is said to have been built in the 17th century by Kempe Gowda after he was released from imprisonment by a neighbouring chieftain, Rama Raya. Legend has it that a secret underground tunnel (now blocked) connects this temple to Shivaganga on Bangalore’s outskirts. Some even believe there is another tunnel that leads all the way to Varanasi in Uttar Pradesh. No matter what its history or legend, I am excited to crouch through a dark cave and sit quietly in a rocky corner when the big city outside is rushing by. Unexpected beauty and quirky surprises like this continue to persist not just here, but in temples across Bangalore. I had always thought Bangalore is accursed to bear the cross of clichéd sobriquets. The “pensioner’s paradise" and “Garden City" of my childhood years became the IT City, pub city and Silicon Valley of India of recent years—the city has been steadily collecting these media medals like a never-say-die general. But none of these epithets do justice to the whiff of history mixed with camphor, incense and jasmine that waft through its old, quiet temples.